If you are planning a summer wedding and your guest list is ever-expanding, you might be wondering the best way to provide food for those you have invited. Warm weather does not lend itself to serving food as you have to ensure that everything is kept cool and refrigerated. The first thing you should consider is whether you are providing a sit down meal, canapés or just buffet snacks. Once you have decided what you want to serve you can then get down to the process of planning the catering. The second factor is whether you are having an indoor or outdoor reception. If you are planning to have the reception inside you have more options when it comes to refrigeration and storage. Outdoor receptions however lend themselves to cookouts and barbeques. Start off the wedding with some sparkling drinks such as giant jugs of different flavoured lemonade or an ice tea bar. If you are serving cocktails anything light and refreshing should hit the spot, think mojitos and Pimms with cucumber slices. The perfect canapé has a range of textures, flavours and colours that compliment the palate. If you are only serving canapés allow 12 to 14 per person. Make sure you have a good mixture of meat, fish, vegetarian and hot and cold. By serving sweet canapés you are signalling that the reception is coming to an end. Any kind of fish can be served on ice or try shrimp cocktails in individual glasses. The aim of an appetizer is to set the taste buds tingling so think small and zingy and not too filling, chicken bites with a fruity twist or fish with a citrus marinade are perfect. What is trending at the moment when it comes to buffets is to have a selection of tables serving foods from around the world. Think Mexican, Thai, Chinese, Indian, Japanese, you name it, everyone is catered for. If you don’t fancy that much work, think about which cuisine offers the best kind of finger food, for example, Mexican food includes nachos and tortillas, whilst Spanish food lends itself to mini food like tapas. If you are having your wedding outside then a barbeque is your best bet as you can cater for everyone. Here you can up the ante by serving meaty and filling courses so aim for prime steaks, lamb or pork kebabs and compliment with mixed salads of green leaves, pasta or even rice. If you are catering for a very large party consider a hog roast with a range of side dishes. Summer screams out for ice cream and you can match your wedding colours or theme with this summer treat. Pick out the main colours of your wedding and serve scoops of ice cream to match it. There are many different flavours such as raspberry, lime, melon and strawberry to choose from. 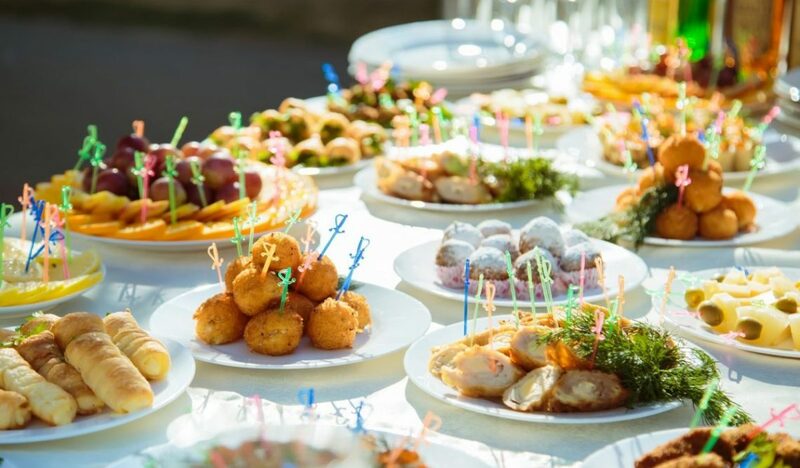 When you hire caterers for your summer wedding, check that they have the facilities they require to put on the food, they have access to hot and cold water and can easily get into the venue beforehand to set up.